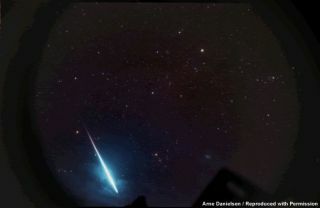 Norwegian astrophotographer Arne Danielsen captured this spectacular Leonid fireball on Nov. 18, 1999. Mid-November brings us the return of the famous Leonid meteor shower, which has a storied history of producing some of the most sensational meteor displays ever recorded. These meteors travel along the orbit of periodic comet 55P/Tempel-Tuttle and whenever that comet is passing through the inner solar system, the Leonids have a chance to provide us with a dramatic show. But the most recent passage of the comet to the Sun came back in 1998 and we are now well past the favored time frame when, for several years running, observers in various parts of the world were witnessing very strong, even storm-level Leonid activity. The most recent Leonid storms occurred in 2001 and 2002. That's why this weekend, when the Leonids traditionally should be at their most numerous, we normally would expect to see no more than 10 meteors per hour, even with the promise of excellent viewing conditions thanks to a New Moon on the 20th. Still, for parts of Europe, Africa and eastern North America, a far more prolific Leonid show could be in the offing this year. On the morning of Nov. 17, 1969, an unexpected burst of Leonid activity was observed from parts of the eastern United States. Meteor rates had been rather lackluster that morning until quite suddenly at around 8:50 GMT, Leonids began falling fast and furiously, with some observers reporting an average of two to four meteor sightings per minute. Peak activity apparently occurred within a few minutes of 9:00 GMT. Then, just as abruptly as the surprising display began, it rapidly diminished until by around 9:20 GMT, things had pretty much returned to normal. Most of the meteors that were observed were relatively faint, although as is typical of the ultrafast Leonids, there were several brilliant meteors, leaving persistent trains in their wake that lasted for many seconds. What caught observers off guard on that morning thirty-seven Novembers ago was the Earth's passage through a very narrow trail of dust that had been ejected from comet 55P/Tempel-Tuttle back in 1932. The densest part of that trail was probably about 30,000 miles (48,000 kilometers) wide, yet the Earth, traveling in its orbit around the Sun at 18.5 miles per second (29.8 kilometers per second), swept through it in only about a half an hour. In 1999, astronomers Robert McNaught and David Asher published a report concerning Leonid dust trails and cited the case of the 1969 outburst. They also forecast that in 2006 the Earth would encounter an adjoining section of that very same dust trail from 1932. The time of this year's encounter is predicted for Nov. 19 at 4:45 GMT. Other reputable meteor forecasters such as Thomas Van Flandern of the United States, Esko Lyytinen of Finland and Jeremie Vaubaillon of France confirmed in their own Leonid studies (to within minutes of McNaught and Asher's) that the Earth would indeed encounter the 1932 dust trail again in 2006. But while another short-lived outburst seems probable this year, it likely will not be of the same intensity as what was seen in 1969. In that year, it had been about 4.5 years since comet 55P Tempel-Tuttle swept past the Sun. But this November will be almost nine years since the comet last passed this way. So when Earth interacts with that same 1932 trail this year the particles probably won't be as thickly clustered together as they were in 1969 and the resultant display might only be about half as strong. Indeed, most forecasters are indicating that a sharp peak of perhaps 100 to 150 (mostly faint) Leonids per hour might be seen this year. Those regions of the Earth that are in prime position to see another potential Leonid outburst are western Africa and western and central Europe where the constellation Leo will ride high in the southeast sky as the peak of the shower arrives. Morning twilight will begin shortly thereafter. In North America, for the Maritime Provinces of Canada, New England, eastern New York and Bermuda, the Sickle of Leo (from where the Leonids appear to emanate) will be above the east-northeast horizon just as the shower is due to reach its peak. But because Leo will be at a much lower altitude compared to Europe, meteor rates correspondingly may be much lower as well. However, this very special circumstance could lead to the appearance of a few long-trailed Earth-grazing meteors, due to meteoroids that skim along a path nearly parallel to Earth's surface. Seeing even just one of these meteors tracing a long, majestic path across the sky could make a chilly night under the stars worthwhile. Unfortunately, for the central and western United States and Canada, the Leonid outburst will likely have passed before Leo rises; at best, nothing more than the usual 10 or so Leonids per hour will likely be seen. Keep in mind that for New England and U.S. East Coast, the peak is due locally on the previous calendar day, Saturday, Nov. 18, at 11:45 p.m. Eastern Standard Time (For the Canadian Maritimes and Bermuda, the corresponding time is 12:45 a.m. on Sunday, the 19th. For Newfoundland it is also on the 19th, but at 1:15 a.m.). No two observers prepare for a meteor vigil the same way. It helps to have had a late afternoon nap, a shower, and to wear all fresh clothing. Be sure to keep this in mind: at this time of year, meteor watching can be a long, cold business. Expect the ambient air temperature to be far below what your local radio or TV weathercaster predicts. When you sit quite still, close to the rapidly cooling ground, you can become very chilled. You wait and you wait for meteors to appear. When they don't appear right away, and if you're cold and uncomfortable, you're not going to be looking for meteors for very long! Therefore, make sure you're warm and comfortable. Heavy blankets, sleeping bags, groundcloths, auto cushions, and pillows are essential equipment. Warm cocoa or coffee can take the edge off the chill, as well as provide a slight stimulus. It's even better if you can observe with friends. That way, you can keep each other awake, as well as cover more sky. Give your eyes time to dark-adapt before starting. Probably the best bet is to rest on a lawn lounge, all the way back, so you can look up and see the whole sky. When you see a streak, mentally run it backwards across the sky. Do the same with the second and third and note where their paths cross. Right there will be the Sickle of Leo (with the bright planet Saturn also shining in that same general vicinity), and that's where the Leonid radiant will be. Joe Rao serves as an instructor and guest lecturer at New York's Hayden Planetarium. He writes about astronomy for The New York Times and other publications, and he is also an on-camera meteorologist for News 12 Westchester, New York. Joe's own 2006 Leonids page is here.